This week, we have narrow down the choice of LCD module into two types, DD-6448BE-2A and DD-12864WE-1A. Both are graphic module. For DD-6448BE-2A, its display format is 64x48 pixels; overall dimension is 18.46x18.10x2.10 (mm); display color is blue; and power consumption is about 0.024 Wat. For DD-12864WE-1A, its display format is 128x64 pixels; overall dimension is 26.7x19.26x2.1(mm); display color is white; and power consumption is about 0.074 Wat. 1. Whether DD-6448BE-2A is too small for display? 2. Can the power consumption power of DD-12864WE-1A be accepted for the final design? 3. Whether people prefer white color or blue color in general? Finally, we deside to try both types. The schematic is changed due to the change of design. Now, my design is to implement a new pcb board which can be used as the development board of the both. By discussiong with Isuru, I have finished the draft of the new schematic board. In general there are two part of the development. The first part is shown in Figure 1. It is the main development board. It contains a PIC18F2620 microcontroller which is used to control the LCD module and communicate with the master microcontroller. The main development board is integrated with LEDs for prower and signal indication, RS232 and I2C for communication testing, and programming header. Figure 2 shows the connector board for each LCD module. Each connector board is used to fix the LCD module on it and to connect with the main development board. However , the current problem is that the connector on the LCD module is made by plastic PCB, not like the female or male hearder in general. The current header design may not suitable for the connection. We will try to solve this problem in the later part. Figure 3 shows the PCB design of the connector and the maindevelopment board. 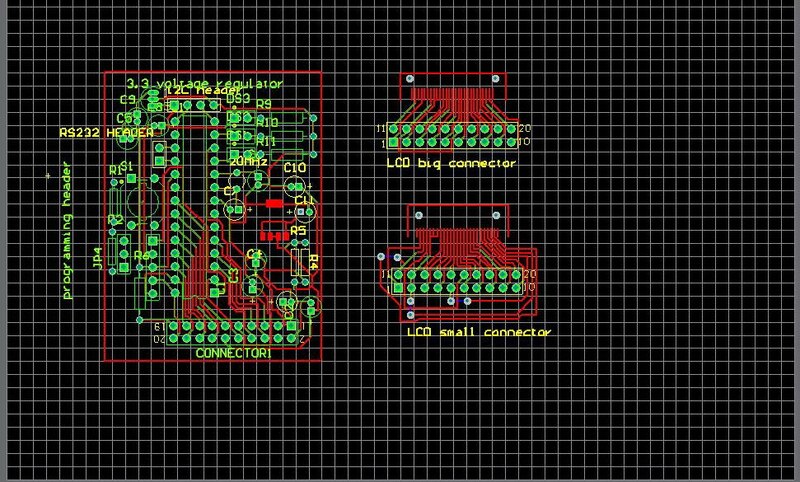 It will be finalized once the schematic is comfirmed and get the design feedback from PCB lab officer. Currently, the size of the main development board is about 5.6x4.2cm and I will try to squeeze it as small as possible in size so that it can either be put into the final robot or the prototype for the surface mount pcb design.